I’ve only been able to see spits and spats of Hibs’ new campaign on the Internet so far but when I see some of the appraisals of the situation by people’s who’s opinion I respect, then I know something is gravely wrong. Leaving the NK Maribor European tie aside for a moment, what we look for from pre-season games is performance and promise. We understand that players are not fully match-fit (that goes for both sides of course!) and whilst it’s always good to attain the winning habit in every game its understood that how the team plays is of prior importance. It’s clear that the team are in some disarray though and look extremely likely to carry this form into the opening games of the season. This leaves me very concerned about season 2010/2011. I’m not normally a person that believes in chopping and changing managers for a ‘quick fix’. I think that can be quite counter-productive, but I think we have an exceptional situation here. In Hughes defence he has had little time to move things his way but I have to say the portents are not good. His is the type of nosedive that very few managers climb out of. When John Hughes came to Hibernian I wasn’t particularly enamoured with the appointment. He was a popular choice with many fans though and looked a reasonable choice. Things progressed quickly and this lead me to bite my tongue on former reservations about him. Fair play to the man. Since that time however I think he has shown that his appointment was a huge mistake. He learns nothing from his previous mistakes and is stubborn in the extreme. Initially I warmed to his talk of his ‘vision’ and began to think he had good and progressive thoughts about the game. Actions speak louder than words however and I think his very regular and increasingly embarrassing sound bites in the media do not disguise the fact that he is basically clueless when it comes to managing a club like Hibs. He is out of his depth. In some ways, we the Hibernian fans take our part in his appointment – as in two or three other ex-Hibby appointments in the past few years. There was a wave of enthusiasm to get those individuals back in the fold. Unfortunately it has been seen time and again that it is not a successful policy. Conversely, the unknown Mowbray was relatively successful and this tells us something. Hibernian FC in 2010 is in most ways a thriving football club. A rarity in modern football. The club is financially sound, has an enviable training facility and the near completion of an impressive new stadium. I do feel that the same ambition is nearly always lacking where managerial appointments are concerned. The club need to spend serious money on getting the right individual – whoever that may be. Bringing in a popular former favourite is a cheap option it seems to me. I’d like the board to show the same ambition and forward thinking that they have in some other areas of the club. On a final and familiar note I was dismayed to see our forty-goal strike partnership of Riordan and Stokes confined to the bench last week in Slovenia. that was the final straw for me. We can argue about tactics and formations ad infinitum but leaving those guys out in that game was ludicrous and baffling. I think the Maribor coach’s reaction best confirms that. The game is simply all about having the best players and they are two of our best and most effective. 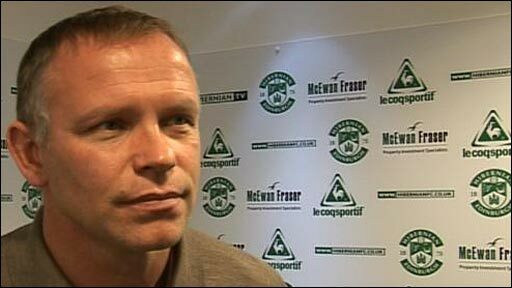 I’m sorry to say that I hope its now the last straw for John Hughes’ time at Easter Road.